Archipelagos and small island nations matter. To foreground the plight of archipelagos, Fiji was designated by the UN FCC to head the discussions to ratify the Paris Climate Change Accord in Bonn. Because of our location in Brooklyn, New York at the confluence of the East River and the Atlantic Ocean, we at Pratt have become keenly aware that archipelagos are some of the most vulnerable and challenging ecological habitats to consider. 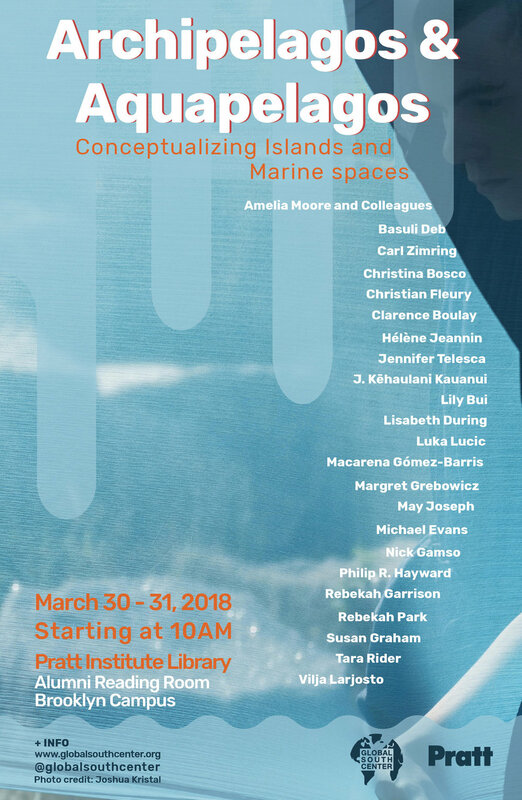 The idea of the aquapelago which integrates uses of marine, biotic and terrestrial spaces - is a conceptual prism through which we further explore issues that arise around questions of decolonial ecologies, small island nations, coastal environments, human, nonhuman and anthropocenic inquiries. The tension between aquapelago and archipelago offers new and submerged perspectives on issues of global sea migrations, disputes over fisheries, and transnational matters of governance. By linking pressing social and ecological concerns to the interpretative humanities, we hope to share emergent knowledges and advance research on the land and water interfaces across archipelagos. In doing so, we raise challenges from Indigenous scholars, activists, and artists who critique continental thinking and deepen our understanding of liquid geographies. We look forward to hosting two days of vital engagement on the planetary repercussions that new approaches to archipelago and aquapelago studies can provide.